While there have been countless movies about writers working on their novels, Lionsgate and Roadside Attractions' new drama Genius takes a much different approach, focusing on the editing of an iconic novel. Yahoo! 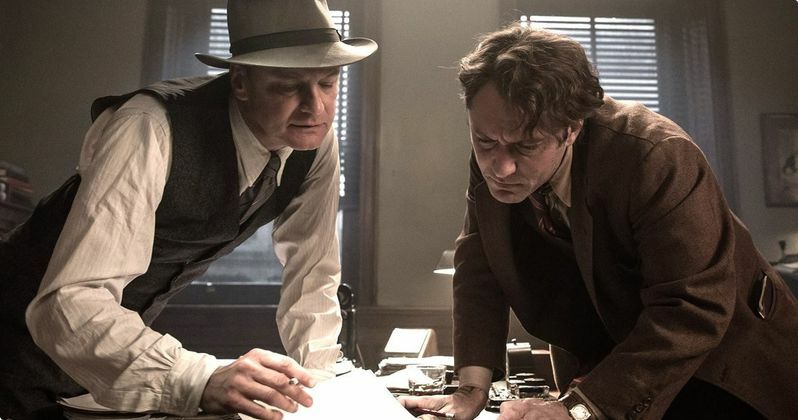 Movies has the first trailer for Genius, which follows the relationship between literary icon Thomas Wolfe (Jude Law) and his editor, Maxwell Perkins (Colin Firth). This trailer showcases how Perkins took Wolfe's first draft of his iconic novel Look Homeward, Angel, and transformed it from a first draft that was over 5,000 pages long into a literary classic. From Academy Award-nominated screenwriter John Logan (Gladiator, The Aviator, Hugo, Skyfall) and acclaimed, Tony Award-winning director Michael Grandage in his feature film debut, comes Genius. This stirring drama centers on the complex friendship and transformative professional relationship between the world-renowned book editor Maxwell Perkins (who discovered F. Scott Fitzgerald and Ernest Hemingway) and the larger-than-life literary giant Thomas Wolfe. Based on the biography "Max Perkins: Editor of Genius" by A. Scott Berg, Genius stars Colin Firth as Perkins, Jude Law as Wolfe, Nicole Kidman as Aline Bernstein, a costume designer sharing a tumultuous relationship with Wolfe, Laura Linney as Louise Perkins, Max's wife and a talented playwright, Guy Pearce as F. Scott Fitzgerald and Dominic West as Ernest Hemingway. Genius is the third collaboration between director Michael Grandage, his producing partner James Bierman and John Logan. The trio worked on the stage production of Red, inspired by artist Mark Rothko, and more recently Peter and Alice, which starred Dame Judi Dench and Ben Whishaw. Michael Fassbender was originally set to star as Thomas Wolfe before he dropped out and was replaced by Jude Law. Lionsgate and Roadside Attractions have set a June 10 release date for Genius, putting it up against some serious competition this summer. It will be going up against the highly-anticipated video game adaptation Warcraft, the horror sequel The Conjuring: The Enfield Poltergeist and Now You See Me 2 in June. It isn't known yet if Genius will get a wide release, or if it will debut in a limited platform release. It remains to be seen how a drama like Genius will perform against these three summer tentpoles, but we'll have to wait until June 10 to find out for sure. Do you plan on checking out Genius in theaters, or will you be watching any of its competitors instead? Chime in with your thoughts below, after taking a look at the first Genius trailer.